Visit the village of Molini di Prela near Dolcedo during your stay in Liguria, Italy. 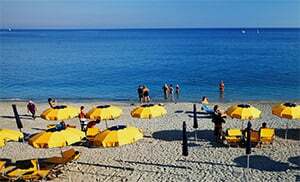 Tradition has it that the Greeks arrived on the coast of the province of Imperia 2500 years ago and chose to settle in the Prino Valley, known in ancient times as "vallis aurea" or the golden valley. The first village grew up around the mills for producing olive oil. The entire valley was defended by the castle of Pietralata (of which only a few ruins remain) and it constituted an independent feudal estate in the territory of Oneglia under the protection of Genoa. In 1340, it became part of the estate that included Briga, Maro and Tenda until 1575, when it passed into the hands of the Savoys, who entrusted it to the D'Oria family. At the foot of Monte Moro, in the mountain village of Villatalla, you will see shepherds taking their herds to pasture and it is possible to buy home-made cheeses here. Valloria has retained its mediaeval architecture: for some years it has been a favourite haunt of artists, who paint the doors of the houses, and it has taken on the appearance of an open-air art gallery. The church of Santi Gervasio e Protasio preserves the first poliptych by Casanova (1523). A small mill is still in use; the old oratory is now used as a countryside art museum. You really should visit is the fifteenth-century church of San Giovanni del Groppo in Molini di Prelà, a village in the lower valley that is crossed by the River Prino. The church preserves a work by Casanova. Then there is the municipal district of Tavole, which derives its name from the wooden planks that were made there for the Imperia shipyards. Prelà is situated in a lush natural basin run through by the River Prino and surrounded by an amphitheater of low mountains, the highest of which is Monte Moro, a name which recalls the Saracen invasions. Together with 15 other municipalities it forms the Mountain Olive Community, which controls the quality of the valley's main resources: olives and superior quality olive oil. Molini di Prela belongs to the municipality of Dolcedo and is one of the villages in the province of Imperia which lies in the Liguria region. There are several other villages near Molini di Prela and they include: Valloria (4.1 km), Canneto (3.4 km) and Casa Carli (2.4 km). When coming from Genoa, take the highway exit to Imperia Ovest and drive along Colla Street and then SP41and SP39 up to Molini di Prela.